Since 2000, we've been partnering with education leaders to increase equity and achievement for all students. Since 2000, Insight has worked with thousands of educators in districts and schools nationwide and abroad to accelerate professional growth and ensure every student has a great teacher. As former teachers, school leaders and high-level district administrators, we've been leading voices in the national conversation on College- and Career-Ready Standards and educator effectiveness. Insight’s ability to provide a variety of custom services and meet clients’ unique needs is driven by our deep understanding of the principles of change and ability to craft thoughtful strategic plans that guide sustainable implementation. Scroll down to learn more about the impact our partners are experiencing in their schools and districts. “The team at Insight Education Group are great thought partners to superintendents, chief academic officers, and other high-level education leaders around the world doing school improvement. Since 2011, Insight has provided multi-faceted support, including leadership academies, to this district of nearly 20,000 students who are majority low-income and students of color. 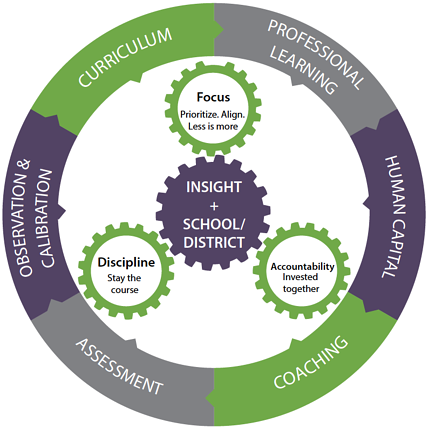 Through the USDOE's Teacher and School Leader Grant, Insight is leading a networked improvement community with educators in small and rural districts across four states. In 2017, ODE engaged Insight to support the development of a statewide teacher leader framework with stakeholder engagement from around the state. Learn how a principal-training model in the Kingdom of Jordan is transforming instruction across the entire country. Since 2016, Insight has provided executive coaching to principals in this network high-need charter schools. Learn more about how this work fits into ACCEL's larger school improvement efforts. A key member of this district's strategic planning process in 2017, Insight is now partnering with Guilford on a number of other key initiatives, including developing curriculum and implementing a PLC model. Insight partnered with Newton on a blended coaching program for math teachers that leveraged video-based observation and feedback. After the first year, Newton saw gains three times higher than the state average on the state Algebra assessment. Since 2017, Insight has partnered with Youth Empowerment Services's Educator Effectiveness Process (YESEEP), funded by USDOE TSL and TIF5 grants, to develop and implement a bold and comprehensive teacher recruitment strategy and plan. Browse articles, eBooks, and more on school leadership, supporting teachers, coaching, and other key educator effectiveness topics. Looking to experience similar impact?